The five-star Landmark London Hotel is a proud member of Leading Hotels of the World and is a luxurious haven in the heart of Marylebone. 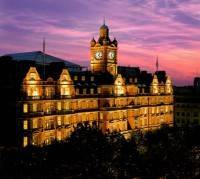 The last of the great railway hotels, The Landmark London is housed in a stunning 19th century building and offers a wide selection of spacious of guestrooms a well as the most flexible suite configuration in the Capital. Our 300 guest rooms, including 1 suites are amongst the largest in London offering an average guest room size of 5sqm/592sqf and suite size of 97sqm/ 1044sqf. We also have several of central London’s truly memorable restaurants and bars. The Landmark London offers an exceptional selection of stunning and spacious event rooms and as a member of the Leading Hotels of the World we have established a reputation for outstanding meetings, conferences and event facilities. From business meetings to spectacular gala dinners, our professional, creative and friendly events team can tailor your event to meet your exact requirements. Many of our beautiful rooms feature floor to ceiling windows, a vast amount of natural daylight, original design features and high ceilings. Our exceptional range of meeting venues can cater for 20 to 750 people. The Landmark London is perfectly located in central London and directly opposite Marylebone rail and underground station. All London airports can be reached within one hour.